Believe it or not there is new construction taking place at four of the neighborhoods in World Golf Village. Here we will be focusing on the two new custom homes being built in the Crest, but if you have a spare moment, you should read about all of the St. Augustine new homes coming to World Golf Village. Alright, back to the main point. St. Augustine home shoppers will be delighted to hear that the Crest, one of the exclusive neighborhoods in the Estates at World Golf Village, will have two new custom homes by the year’s end. Both homes are currently under construction and will be priced from the $700’s. 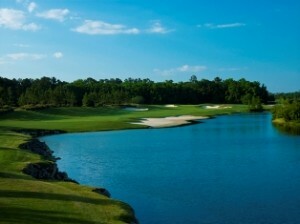 Most every homesite at the Crest is situated on the biggest lake of the King & Bear golf course. So, from the comfort of your backyard, you’ll be able to enjoy the beautiful natural views of the water and the golf course. In addition to the views, these sites are generously sized and adorned with ancient oak trees and beautiful pines. At the Crest, preservation of the natural beauty of the community is a top priority. The community is conveniently located near the King & Bear clubhouse and the Swim & Tennis center. So, feel free to spend weekends and free time perfecting both your golf game and tennis game. If luxury golf front living in Northeast Florida sounds appealing, stop by World Golf Village soon to take a look at the two homes under construction. Considering there are only two, they are expected to sell quickly.